Last updated: 10:30 Saturday 14 December 2013. LiveBlog now suspended, see below. Disgruntled hauliers and farmers – and other political groups – are threatening to ‘paralyse’ Italy’s motorway network this week, and ‘lay siege’ to city centres. Organised by truckers’ federation Trasportounito and Movimento dei Forconi (Strike of Pitchforks) along the lines of a successful protest last year. The government says protestors are not allowed to block roads or break other rules of the road. So far, despite a large turnout in places, protestors are complying. Traffic on major routes has not been significantly affected this week though city centres, especially in the north west, have indeed been almost under siege. 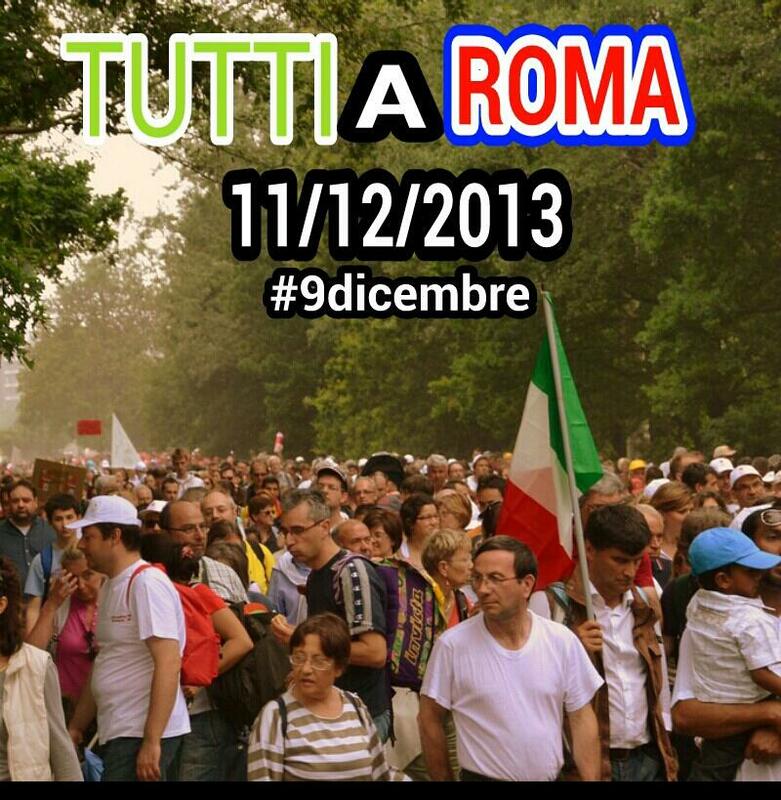 See #forconi (pitchforks), #sciopero (strike), #trafficobloccato or #9Dicembre on Twitter. See the CCIS roads viability website (click on the road in the left hand column. Incidents containing ‘Manifestazione’ are connected with the strike), the national traffic website or follow @Emergenza24 for the latest on the roads. Both AGI Italia and ANSA new agencies run up-to-the-minute English language news services. 10:30 – with the transport strike officially now over – and the main road network functionally normally so far today – coverage of any new developments will switch to our daily newsblog. A statement from Trasportounito this morning however says Secretary General Maurizio Longo will meet with the minister responsible for transport and infrastructure Rocco Girlanda somewhere in Perugia this evening at 18:30, which might prove interesting. 14:00 catchup – Turin has apparently returned to normal after four days of sustained protest but there have been demos at other sites around the country though the major road network has been free flowing. There’s been an outburst of anti-Semitism from one Pitchfork leader Andrea Zunino who told one paper Italy was a ‘slave of Jewish bankers’. There’s also a suggestion that Italy, Austria, Switzerland, Germany and France will lift weekend restrictions on trucks to help them catch up but that isn’t officially confirmed yet. 06:30 – entering the final official day of the transport strike with the prospect though that protests across Italy will drag out over the weekend and into next week. The situation on the roads looks normal so far. Trasportounito denies reports that the strike has been lifted. 19:00 – it’s the last official day of the strike tomorrow but some more logistics unions down tools tomorrow and Saturday though it’s not certain how big an effect this will have. The major demonstration in Rome is now confirmed for Saturday with supporters being offered free train tickets. The motorway strike hasn’t been able to paralyse freight transport as it intended but the pitchfork demonstrations in city centres have certainly been sustained. It’s ironic in a week when the economy stopped shrinking for the first time since 2011 and the prime minister finally achieved some leverage in parliament. Youth unemployment however rose to just under 42%. 14:40 – not a huge amount to add other than that students have now joined the protests, smoke bombing a conference attended by cabinet ministers in Rome. The inbound A24 west of Rome has seen traffic build up all afternoon but that’s due to road works. There are various protests around the city however. Milan is much quieter than earlier. 11:00 – violent scuffles in Turin and Genoa so far today bringing the total number of police injured to 14. Peaceful protests in Milan and Rome with major disruption to traffic. 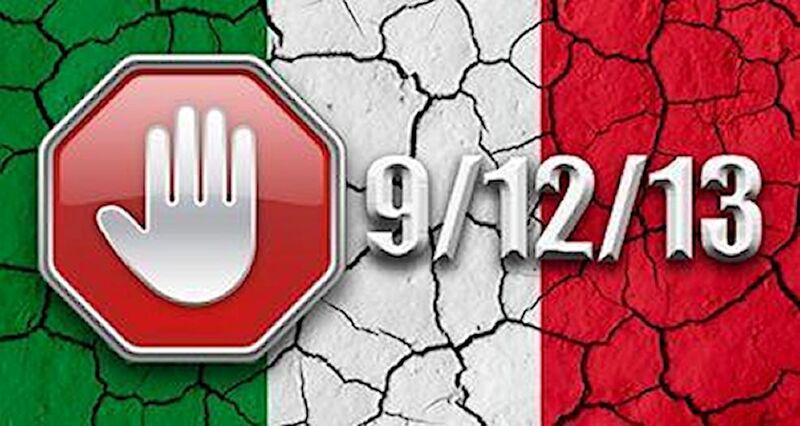 Big demonstration planned for Rome on Saturday. 09:00 – the roads in and around Milan are still very busy – not sure if because of protestors – but the big news so far this morning is that Forconi blocked traffic from France at border town Ventimiglia on the coast. However, the roads have since reopened after police cleared protestors with tear gas. The A8/A10 motorway has so far not been affected. 07:00 – it’s noticeably busy in Milan this morning though there are no other signs across the country so far that the protests have increased after the government survived two votes of confidence yesterday, the second late last night. Today is likely to be the make or break day, with a potential ‘March on Rome’, see below. The latest statement from Trasportounito reiterates the one from last night. 21:55 – Prime Minister Letta has won the second vote of confidence. Leaders of the Pitchfork protestors had said that if MPs voted with the govt then they will ‘Occupy Rome’. 21:30 – the strike continues according to the latest statement from Trasportounito, who also deny press reports they are intending to blockade Milan and advising residents to refuel. 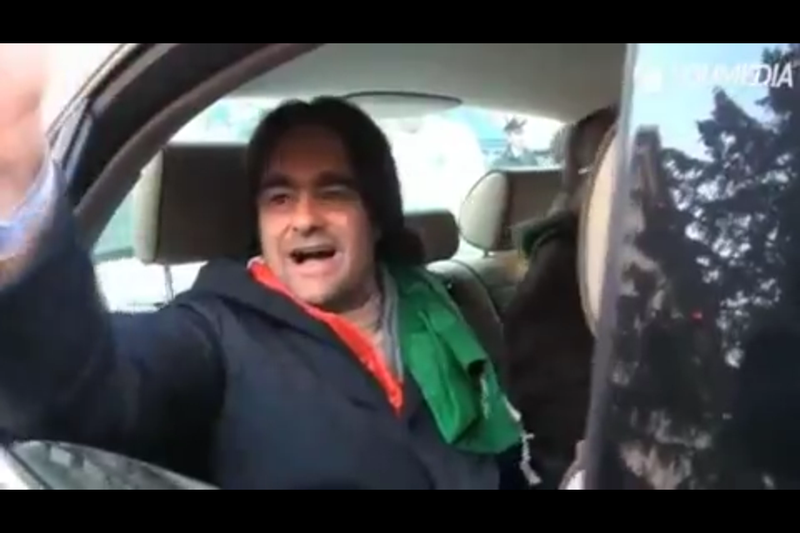 Pitchfork leader Danilo Calvani leaves a stump meeting in Genoa this afternoon in the back seat of a Jaguar – not quite the car you would expect him to own given that he’s head of a movement driven to desperation by poverty, but then he says it’s not his. 15:00 – the Italian government has survived the vote of confidence in parliament. Pitchfork protestors have threatened to ‘occupy Rome’ if this happened, though there is another confidence vote in the second house later. 14:00 – Pitchfork protestors have been involved in several violet incidents this morning, including with Dutch Ajax football fans in Milan. Arsenal fans in Naples have been warned to avoid a demo in the city centre. Roads around cities mainly in the north have been blocked – Turin, Milan and Genoa – but the motorway network is as free flowing as it has been all week. 12:00 – Trasportounito will not now have time to meet with Silvio Berlusconi this afternoon. 09:45 catchup – the meeting with Berlusconi today is dividing protestors. Only Trasportounito will attend according to TransportEuropa, the others wanting to avoid ‘being exploited in a political clash’. Trasportounito meanwhile says it hopes for some signals from govt that it is open to dialogue this evening. @newsfromItaly warns: ‘Be warned: Trouble could flare up in central #Rome #Italy today owing to pitchfork protesters.’ Much apparently depends on how the vote of confidence goes in parliament this morning. 06:15 – no change overnight. In it’s latest update posted at 00:00, Trasportunito affirms the previous one, adding that the events of the day ‘leave a bitter taste in the mouths of those who gave us losers from the first day’. Will meet with ‘Prime Minister’ Berlusconi at 17:00. Notes the press release from the government about a meeting on 17 December. 20:30 – if the truckers’ strike is faltering – maybe – then the Pitchfork Movement is certainly gathering steam. One of the leaders, Danilo Calvani told ANSA news agency that millions of Forconi would go to Rome unless MPs abstained in a vote of confidence scheduled in parliament tomorrow. For a complete overview of the day’s events see this roundup from ANSA. 17:30 – the strike continues according to the update from Trasportounito, finally published at 17:00 GMT. It says it has not received an invitation to the meeting on 17 December (below) but will meet ‘President Berlusconi’ tomorrow at 17:00. 16:00 – there are letters going backwards and forwards between the government and protestors this afternoon, and other trucking organisations. One released by Aitras the Sicilian hauliers association said, ‘The eight associations are ready to dialogue and to lift the latch of road.’ The latest was an invitation from the minister responsible for infrastructure and transport Rocco Girlanda to all parties to meet on 17 December. Still no update/statement from Trasportounito. 15:30 – the statement from Trasportounito, due at 15:30 CET, is late again. 14:15 – a report from TrasportoEuropa says Trasportounito is planning the March to Rome tonight, congregating at RAI television studios at Saxa Rubra, just north of Rome, at 23:00. 12:30 – there’s talk of a March on Rome (‘Marcia su Roma’) if demonstrators’ demands are not met, worryingly reminiscent of Mussolini’s 1922 March on Rome when he took power. More politically correct to call it ‘Tutti a Roma’. 12:00 – protests are ongoing in Turin says AGI Italia news agency with road blocks to the north and south of the city after demonstrators apparently tired to storm an early morning fish market. There are lots of reports of individual actions but the national road network seems as functional as ever – though TomTom reports ‘people on the carriageway’ on the A14 in southern Italy, between Bari and Foggia. 10:15 – the statement from Trasportounito has now been published: says strike continues, with ‘snail’ moving roadblocks and concentrations at the gates of major towns. No sign of any particular disruption on the traffic websites as yet. 09:30 – the update promised by Trasportounito for 10:00 CET is late. In the meantime, an article from TrasportoEuropa tries to get to the bottom of competing claims from each side about how successful yesterday’s protest was: it concludes both are propaganda though says the distribution of fuel, consumer goods and industrial production was not majorly disrupted. 06:45 – nothing special to report on the roads so far. The latest statement from Trasportounito says there was no news of importance overnight but that they expect new initiatives to be announced today. Roundup: as the clock ticked past 00:00 last night and the roads of Italy failed to light up red on Google Maps and TomTom, there’s was an impossible to ignore feeling that this strike wasn’t going to come off. The police had set such stringent conditions – no blocking carriageways, no breaking the rules of the road – that it didn’t leave much room for protestors to actually demonstrate. When the roads were still green this morning it definitely looked like a damp squib. However, by mid-morning reports of protests were coming through thick and fast. Even though there were few sustained road blocks, judging by the substantial turn out at demonstrations in many city centres support is widespread support. Cleverly, rather than blocking the roads, from what we can gather it seems groups are obstructing – partially or completely – on and off ramps of major roads (thus, presumably staying within the letter of the law). The question is what happens next? Having achieved a decent turn-out – and having apparently kept 80% of transport off the roads, and not fallen foul of the police – the momentum is with the strikers. With another four days remaining our feeling now is that this one could be a grower. Unless the government caves in. 19:30 – a new statement from Trasportunito says the strike continues, that the protestors are obeying the rules – just handing out leaflets and not blocking the roads – and that ‘at the end of the first day the balance is definitely positive.’ That’s followed by a substantial list of ‘build up’ points around the country, quite a few more than earlier. 18:00 – a statement from Trasportunito claims that 80% of transport activities have been blocked on roads and highways today. 15:45 – a much longer list of blockages has been published by @Emergenza24, relating to A1, A3, A4, A14, A22, A27 and A28, plus bypasses at Vicenza, Bari and Turin and some state roads. The traffic on the carriageways is flowing freely, the blockages are on the on and off ramps and at some toll stations. 14:15 – a refreshed list of protest sites from Trasportunito which says much the same as previously about complying with the rules. Secretary Maurizio Longo will be on Rai TV News tonight 18:30-19:00 and there will be another statement afterwards. National road network currently unchanged. 12:00 – a video from @Josephi56240181 showing a huge demo in the centre of Turin. Similar also talking place in Naples, Trieste, Genoa, Milan, etc. 11:30 – @Emergenza24 publishes a list of ‘blocked’ junctions and toll stations mainly, on the A1, A3, A4, A14, A27 and A28. 10:15 – @newsfromItaly in Milan reports: ‘This road viability service is reporting that tracts of motorways in #Italy are being shut down by #strike.’ We cannot confirm this, traffic on TomTom and Google maps looks normal. 09:50 – another list from Trasportunito of the affected roads and junctions. It adds protestors are complying with the rules and avoiding road blocks: ‘Everything is taking place with serenity and full cooperation of the police, whom we thank.’ Overall, from TomTom and Google, the national traffic picture is not too bad, maybe a combination of drivers avoiding the roads today and the strikes being go-slos rather than blocks. 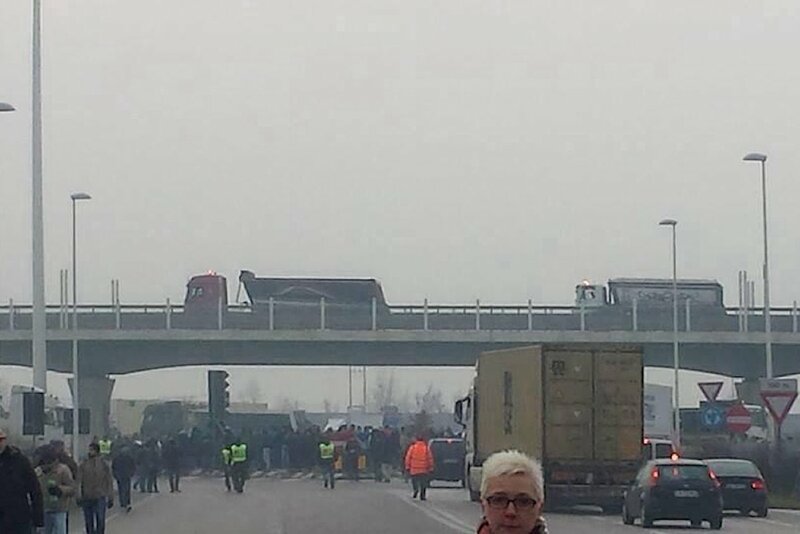 09:00 – @Josephi56240181 reports A1 Reggio Emilia>Parma closed by demonstrators, confirmed on TomTom. 08:45 – in its roundup @TrasportoEuropa mentions several places where strikes are taking place: Genoa, Bolzaneto tolls and Port of San Benigno; Turin Orbassano; toll Soave A4; toll A1 Orte; toll Agrate A4 Milan and Frosinone on the A1. 07:30 – we take note of the long list of protestors’ sites below but there still doesn’t seem to be anything out of the ordinary happening on the roads. 06:15 – Trasportounito has published a list of junctions where protestors have ‘built up’. 06:00 – no obvious signs of lock down currently. Catch up with yesterday’s events here.